Launched at ISH the new Shower Plus collection from Zucchetti comprises a huge range of showerheads designed to transform the shower into a truly pleasurable sensory experience. Offering chromotherapy, aromatherapy and water-therapy, the Shower Plus range is dedicated to wellness and individual personal care. Hi-tech functions have been built into generously proportioned aesthetically pleasing shower heads, suitable for both home or contract use. The 'wellbeing' chromotherapy colour, aromatherapy and spray functions can be personalized to suit individual needs and taste providing light and scent sensations together with everything from a soft rainfall experience to calm and soothe through to vigorous, drenching cascade jets to stimulate and refresh. Round shower head - 600 mm - 3 versions: with rain and/or atomizing jets available with chromotherapy or with chromo and aromatherapy. Touch display to control the various functions. Square shower head 170x170 mm with rain jet and chromotherapy, available also self powered. 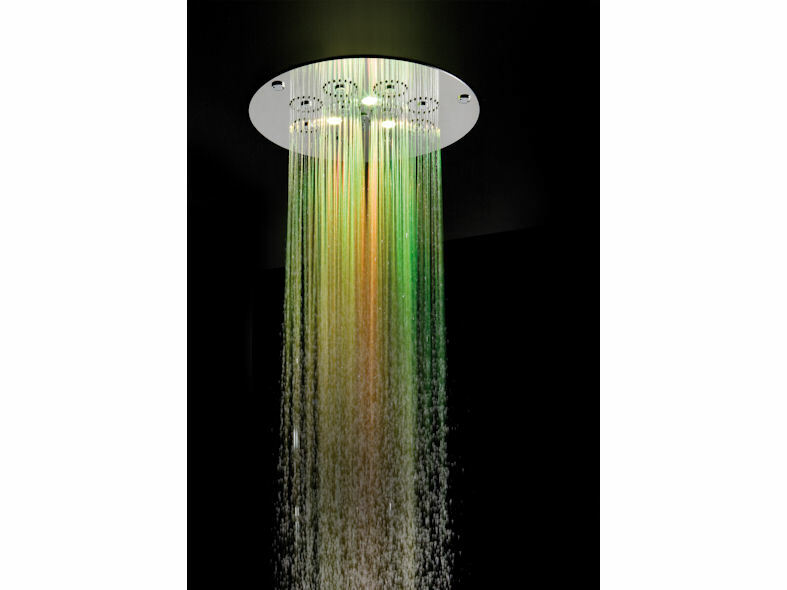 Square shower head 420x420 mm - 2 versions: with rain and/or atomizing jets + chromotherapy or + con chromo and aromatherapy. Touch display to control the various functions. Square shower head 430x430 mm with rain, blade and atomising jets. 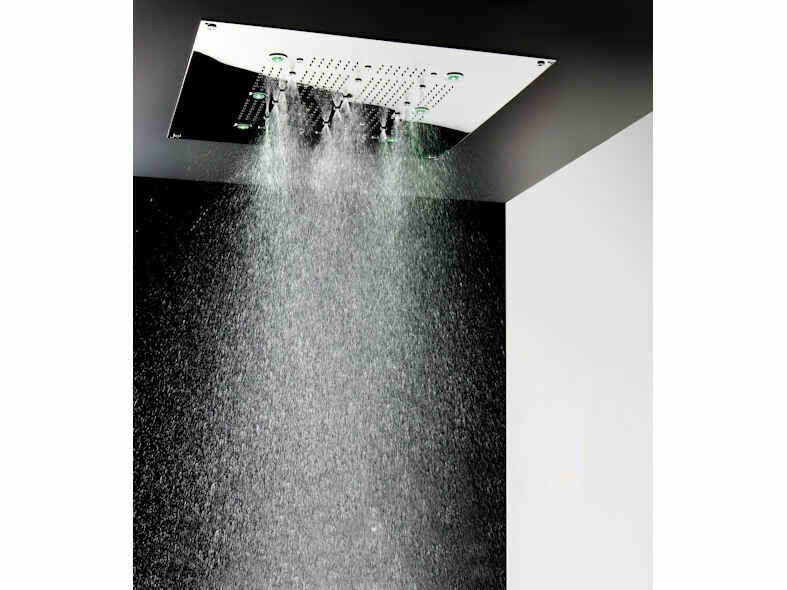 Square shower head 600x600 mm - 2 versions: with rain and/or atomizing jets + chromotherapy or + con chromo and aromatherapy. Touch display to control the various functions. Rectangular shower head 370x240 mm with rain jet and chromotherapy, available also self powered. Rectangular shower head 370x240 mm with rain jet, chromotherapy and sound system, control panel and MP3 player holder. 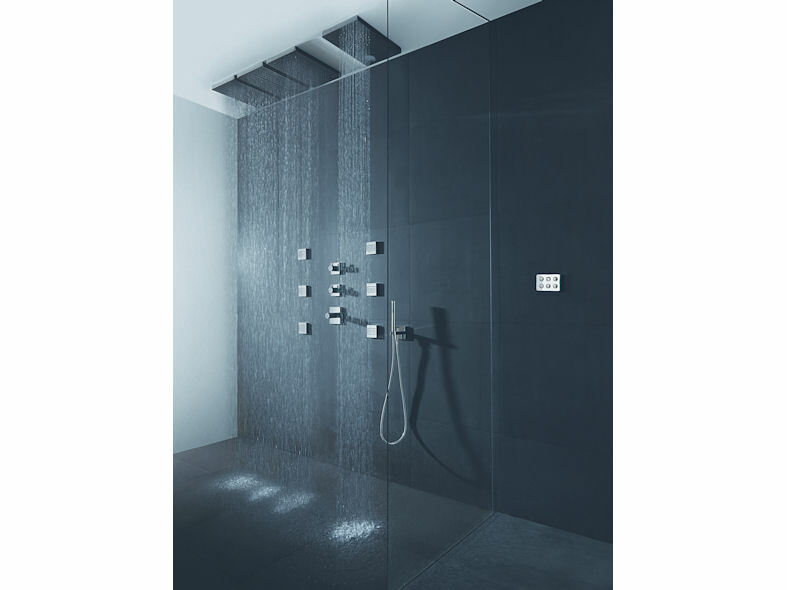 Rectangular shower head 600x400 mm with rain, blade and atomising jets. Rectangular shower head 680x420 mm with rain jet and chromotherapy. Touch display to control the various functions. Chromotherapy with led RGB system that allows the option of one single colour or the colour rotation. Relax - a pleasant and relaxing bouquet that combines the fresh notes of citrus, with the unmistakable jasmine. Energy - ideal to start the day with power, it has a fresh and fruity aroma, characterized by lilac, iris and rose. Flowers - this sensual, hot and strong aroma is characterized by lemon, bergamot, bitter orange and cinnamon. Also available are a number of blade flow spouts and lateral jets providing additional personalization options.